This is the time of year when we start looking back at our year, what we have accomplished and, sometimes, what we still want to do. We can be harsh on ourselves, when we didn’t get through our resolution list. Instead, experts say it’s important to look back on what we HAVE accomplished. “I measure my success by the number of good ideas that I’m able to implement,” said Carolyn Goerner, a professor at Indiana University’s Kelley School of Business and co-director of the Kelley Women’s Initiative. For her, that means adding new ideas to her class, organizing her wine collection and teaching her dog a new trick. For Carrie Kerpen, author of Work It: Secrets for Success from the Boldest Women in Business, it’s looking at how she used her time. “At the end of every year, I review two things: My calendar and my photos. I look at my calendar to see how I spent my time, and I look at my photos to see if I enjoyed it,” she said. 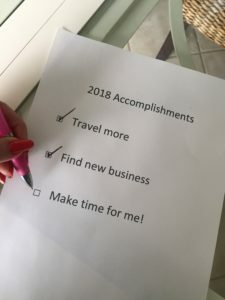 So what is successful year for you? Is it a full calendar of bookings? Is it being able to be there for your family because your schedule is flexible? Is it taking a well-deserved family vacation? This is the time of year to be grateful for what we HAVE accomplished instead of worrying about what we haven’t. Because there’s a good chance your accomplishments are much more important to you. Sounds like that was written just for you, right?? We are thankful and honored to have you, our successful women, as part of the Pure Romance team. And we hope you look back on this year with a sense of accomplishment and optimism for next year.